Apple's store in Delaware's Christiana mall beats all others in selling iPhones. 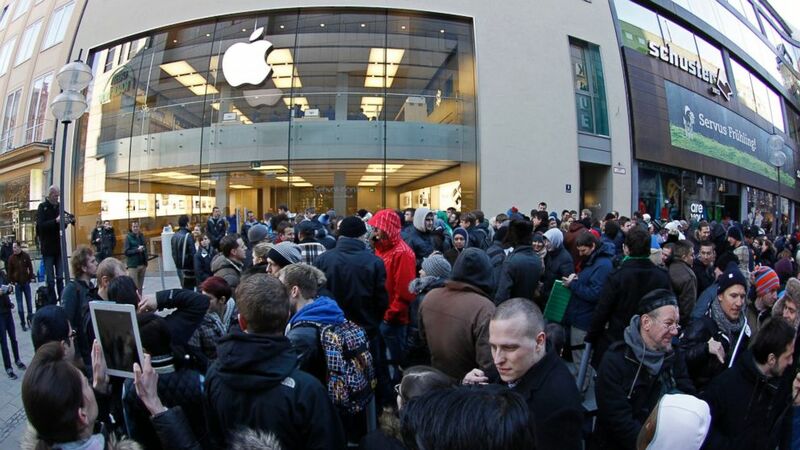 camera (Michaela Rehle/Reuters) People crowd in front of an Apple store in Munich, Germany, in this March 16, 2012 photo. Sales clerks at an Apple store in Delaware proudly tell customers what Apple headquarters seems intent on keeping secret. The store sells more iPhones than any store in the country. The store is located in the Christiana Mall, about halfway between Newark and Wilmington in the northern part of the state. The enormous mall attracts buses of shoppers from across the line in New Jersey to the north and Maryland to the west as well as from further away like New York and Pennsylvania. The attraction is Delaware's lack of a sales tax. The result: "We sell more iPhones than anyone," a clerk said proudly this past weekend. Apple refuses to confirm which of its stores is the top seller. An Apple spokesperson tells ABC News that the company does not release sales information beyond the disclosures made in its financial reports, which do not break out performance numbers for specific stores. But sales staff at the Christiana Mall store are quick to brag. "The only store that does more volume is the glass box on Manhattan's Fifth Avenue and that is open 24 hours a day. But no one sells more phones than we do," a Christiana clerk told ABCNews.com. The salesman echoed what ABCNews.com was told on a visit a few weeks earlier and both salespeople said they were told of their ranking by their store bosses. The names are being withheld because they are not authorized to speak for Apple. One clerk told ABCNews.com that the store and its lack of a sales tax is popular with people who buy dozens, sometimes hundreds of phones at a time and take them to foreign countries to resell them at a profit. The manager of an Aerosoles shoe store near the Apple outlet told ABC News that chartered buses full of shoppers arrive at the Apple. "They've got New York plates," she said. Stephen Baker, vice president of industry analysis for NPD, a consumer marketing consultancy, says Apple stores in general have the highest gross sales per square foot of any in retailing, higher even than those of jewelry stores, including Tiffany's. The reasons why the store ranks among Apple's top performers aren't hard to see, said Mall general manager Steve Chambliss: This is Apple's only store in Delaware, a state with no sales tax. The mall's location on Interstate 95, which links the Northeast corridor, makes it easy for shoppers from three adjacent tax-charging states to flock here. "We're the key shopping destination between Baltimore and Philadelphia," said Chambliss. "We've got 6,500 parking spaces, and they're always all full." So heavily-trafficked is the store that it is guarded by Delaware state troopers. There are at least two troopers at a time—as unsmiling as Buckingham Palace guards -- inside the store with as many as 10 at the store to rotate through shifts and provide for crowd control. Last November a customer was injured when a crowd of at least 100 people tried, all at once, to get in the front doors when the store opened 9 a.m. The crowd was dispersed and no arrests were made, according to the Wilmington News Journal. Sgt. Paul Shavack, spokesman for the Delaware State Police, told ABC News the troopers are assigned to the store on a "special duty" basis, meaning their time is being paid for by Apple, not by Delaware taxpayers. Dr. F. Todd Wetzel, professor and vice chair of orthopedic surgery at Temple University, uses the store's Genius Bar. He told ABC News that anywhere from four to 10 troopers routinely are on duty, depending on the volume of shoppers. When the iPhone 5 was introduced, says Wetzel, there was a cordon of troopers keeping order, dressed in uniforms he calls "the sharpest of any in the nation." The only thing that could have been more dramatic, he said, was if they had been mounted on horseback. "That would be the ultimate in crowd control," says Wetzel. "But it hasn't happened yet."